Address: 2250 W Cortez St, Chicago, IL 60622. 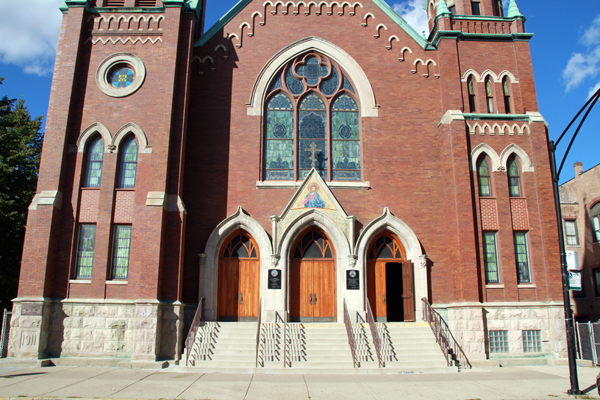 Architect: Worthmann & Steinbach, 1913. Visited the cathedral as part of 2015 Chicago Open House.. 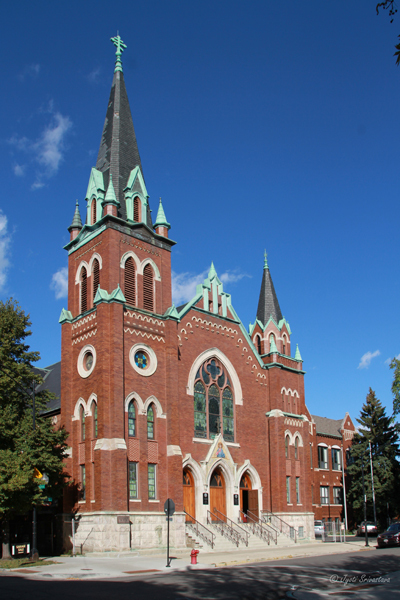 The church edifice that currently houses St. Volodymyr Cathedral was built in 1911 as a German Lutheran parish. 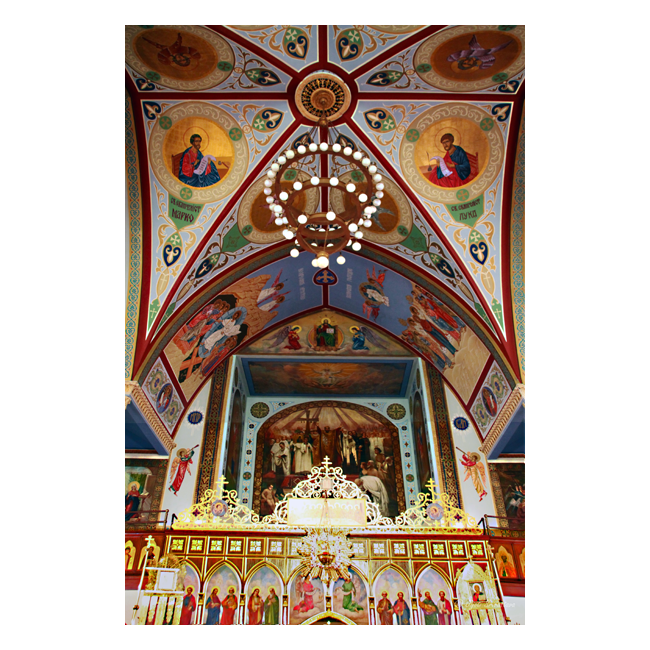 For this reason, both the exterior and the interior of the church differ in some respects from the traditional Orthodox design. For example; the church has a spire that soars towards the sky, rather than a dome symbolic of the heavens that is characteristic of Orthodox church architecture. 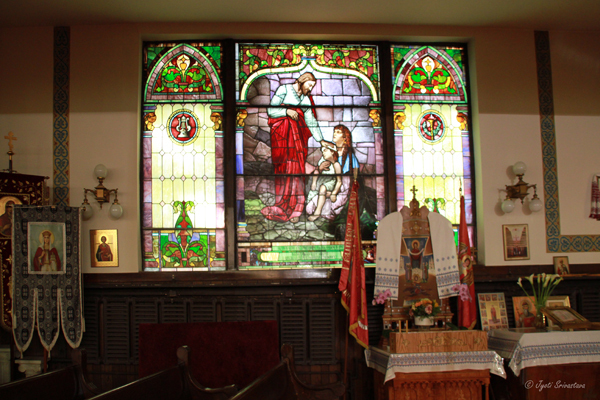 In addition, the church faces north rather than east as is traditional in the Orthodox church. After St. Volodymyr’s purchased the church in 1945, much of the exterior of necessity remained the same. 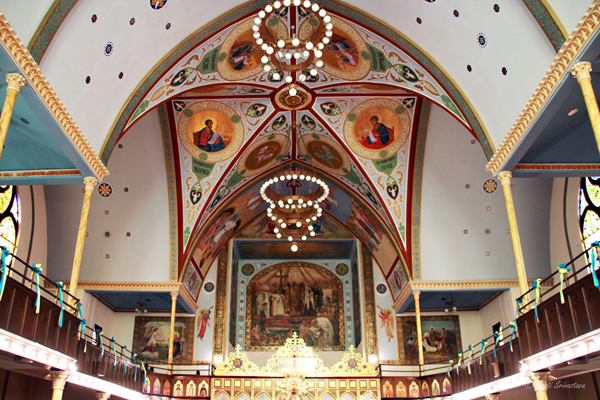 Great efforts were undertaken , however, to remodel the interior of the church, so that it conform to traditional Orthodox church design. 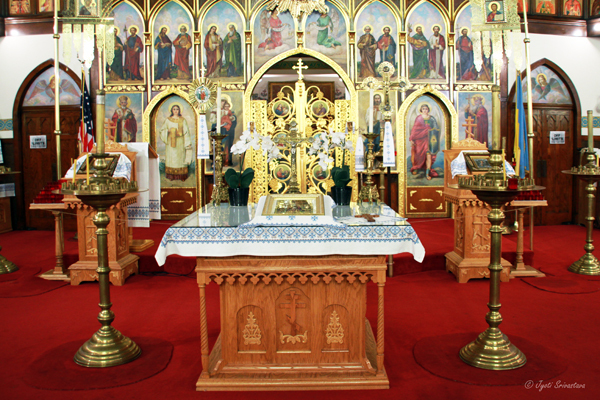 In general, the Orthodox church can be thought of as consisting of three parts. 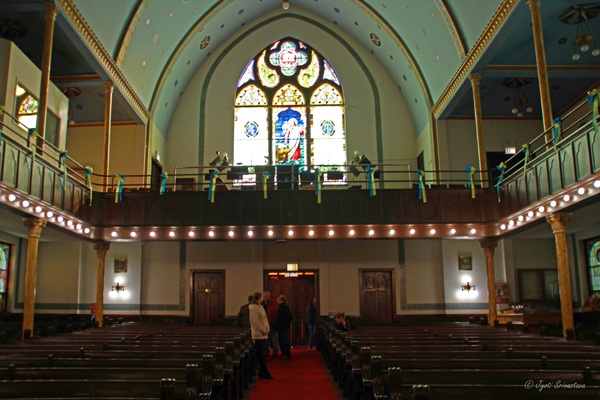 NARTHEX/ VESTIBULE: After passing through the front doors one enters the vestibule or narthex. While in the narthex, the visitor [worshipper] is symbolically still in this world. NAVE: After leaving the narthex, the visitor enters God’s world or the nave where the congregation worships during church’s services. 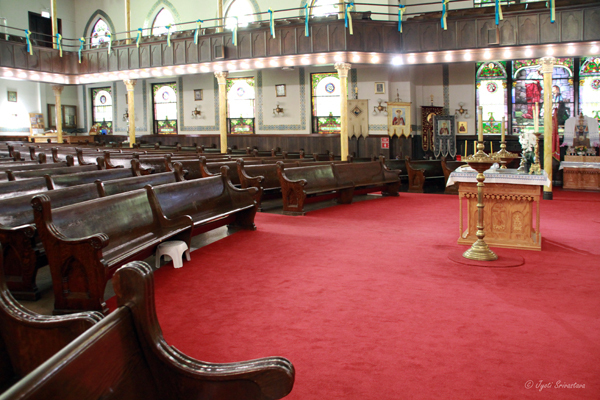 SACTUARY: The front part of the church is the sanctuary, which contains the alter. It is from here that church services are conducted. 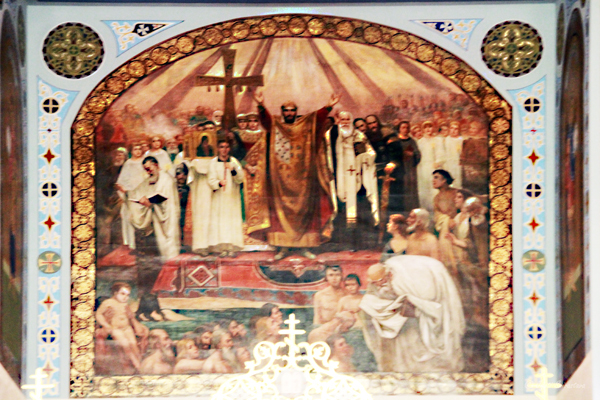 On the front wall of the cathedral above the alter is a painting that shows patron saint Prince Volodymyr presiding over the baptism of Ukraine in 988. 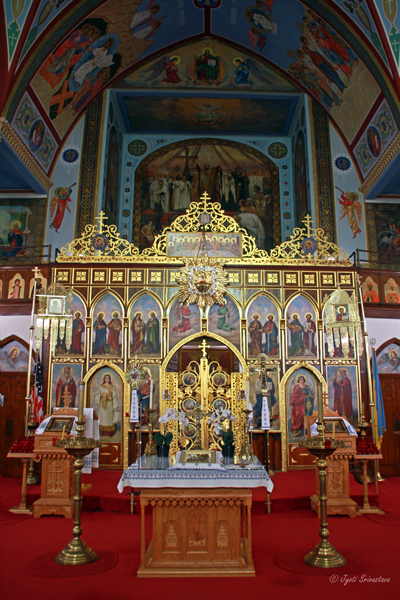 ICONOSTASIS: or icon-screen separates the nave from the sanctuary /altar . 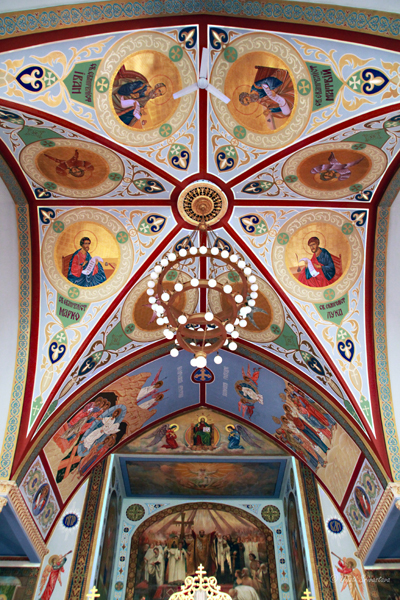 The upper tier of icons depicts the twelve apostles. In the middle of the icon screen stand riyal doors which open to symbolize the opportunity to symbolically bond with Christ the King. The beautiful have images of the four Evangelists. 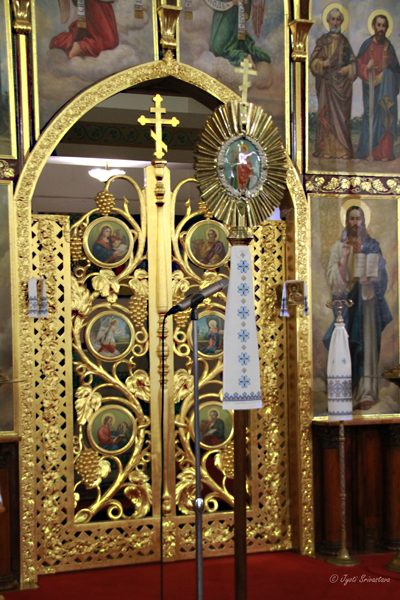 Besides the royal doors the iconostasis has two smaller deacon doors with paintings of the Archangels Michael and Gabriel. At the far right of the iconostasis one cn find the image of the church’s patron saint, in the case of this church, prince Volodymyr. The CROSS: Another sacred object found throughout the church is the symbol of Christianity itself, namely, the cross. Although one may find different types of crosses used within the Orthodox church, the type used in St. Volodymyr Cathedral has three bars, with the lower cross bar slanting diagonally and pointing upward to the left [from the viewer’s perspective]. The portion of the bar pointing upward represents the thief who was crucified alongside Jesus and who accepted Christ as his Savior. The portion of the crossbar pointing downward represents the crucified thief who did not. 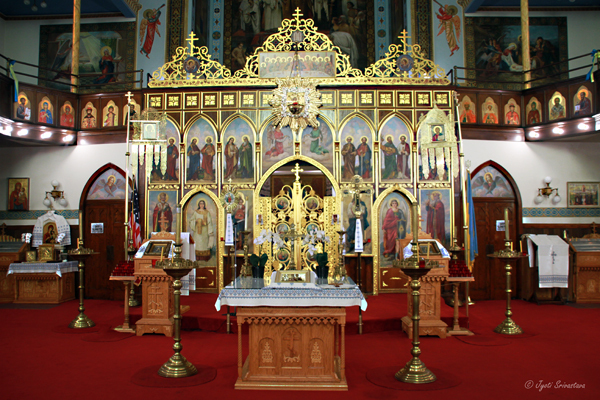 ICONOGRAPHY: In addition to the iconostasis, one can see many other places in the church that are beautified by icons. Icons [from Greek word meaning image] may portray Jesus, his disciples or saints. When the faithful pray before an icon, they are not praying to the icon itself, but rather to what it represents. For this reason icons are sometimes called “windows unto heaven”. During services the church is illuminated with the light of many candles. Worshippers light candles and place them in the candelabras as they pray for the health or memory of a loved one. Candles illuminate many icons and are held around the clergy during the reading of the Gospel to emphasize that the word of God enlightens the world. 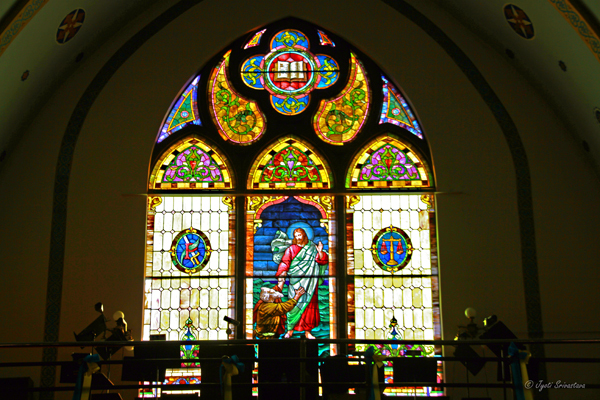 In addition to light, church services are also filled with the sound of music. In most Orthodox churches, the only type of instrument used is the human voice. 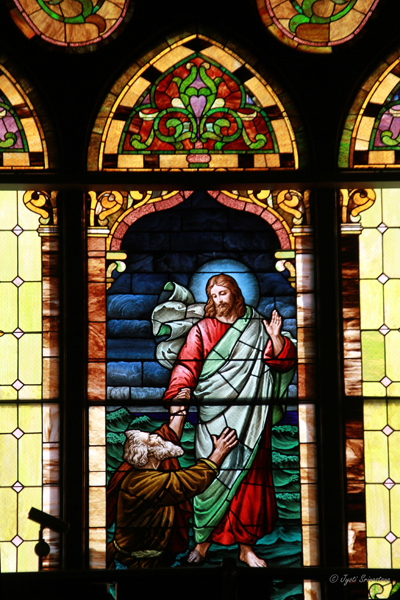 The choir sings from a loft under the large stained glass window that depicts Christ walking on water. 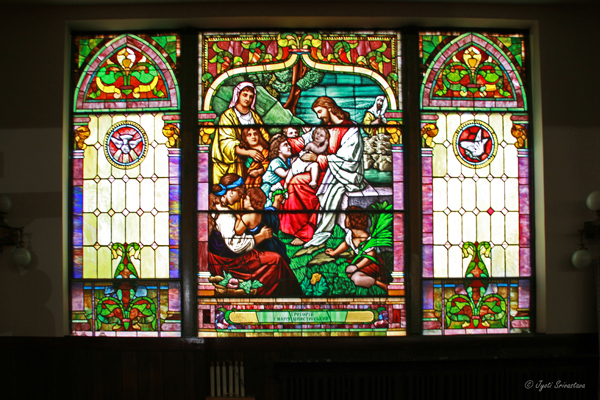 The window, like many of the stained glass windows on both of the first and second levels of the church, where inherited from the original building. During the years, however, they have required extensive maintenance and the names that currently appear underneath them in Ukrainian are those of the benefactors who sponsored their restoration.